Every client’s wedding is different and we treat each one as a unique one off event. We do have a plan that we work to (to ensure that we provide a guaranteed standard of work) but we also adapt our plan to every individual wedding. As you will see from our real weddings gallery we do not pull out a set repertoire of shots for every wedding but rather we adapt to each event and the individual character of each of our clients. Everyone has a unique personality and our aim is to capture that in the most natural and creative way possible and to faithfully tell the story of your special day. What will work for one of our weddings may not work for another, which is why it’s important for us to not just use the same shots and poses over and over again. We really enjoy the challenge and the excitement of the day and want our clients to have a unique and beautiful collection of wedding photographs. This starts with our first meeting. Throughout the whole process we will try to get to know you, learn about your individual tastes, your plans for both your wedding day and your back story, so that on the day we have a clear vision of how to best capture your wedding story so that you don’t have to concern yourself with anything other than enjoying your day. Experience has taught us that it’s always important on your wedding day for us to have a good rapport with your guests and we are always happy to take requests for specific photographs throughout the day. Our style of wedding photography combines creative portraits with reportage, or documentary photography. In essence most of what we do on a typical wedding day can be broken down into three main categories: Candid Moments, Creative Portraiture, and Relaxed Group Shots. We like visually strong, eye catching images, that have a wow factor, so we try to create that when we shoot the bride and groom portraits. During the rest of the day we tell your wedding story through classic documentary or reportage photography. 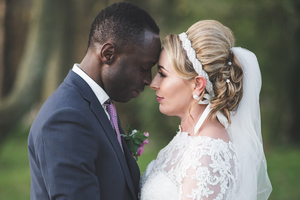 Our approach here is to be as unobtrusive as possible and we aim to capture the emotions, events and details of the day - the laughter, the tears, the expressions of you love for each other in a natural and candid way.